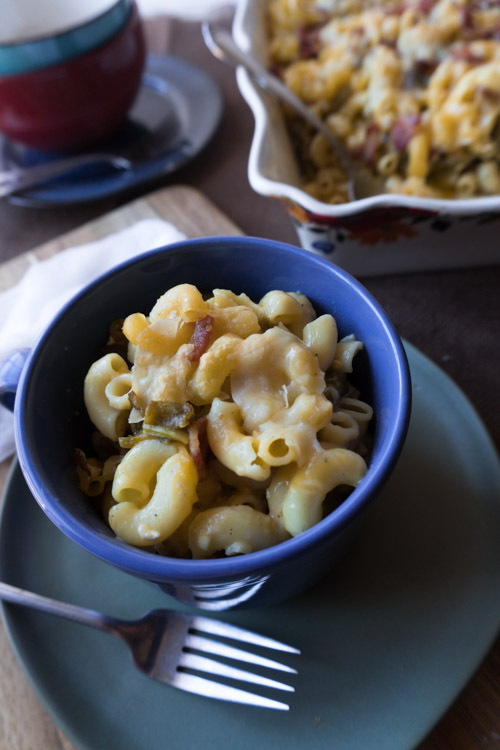 Make this easy bacon mac and cheese recipe and your family will keep asking for more! It is seriously so good and so cheesy! As a kid I grew up eating the Kraft Mac and Cheese with the orange powder. I remember going to my grandma’s house where she would make it for all of us kids and then she would have extra cheese powder to pour on top. I still don’t know where she bought it from, but I admit- I loved it! 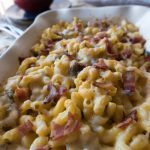 These days, the boxed mac and cheese doesn’t sit well with me so I make my own delicious four cheese mac and cheese! I have to tell you though, trying to get a sauce that I was happy with took a few attempts, with many of the attempts ending up in the trash. I kept trying to make a roux and then adding in milk and cheese, only to have it turn out grainy and curdle. Even heating everything super slowly to prevent separation of the cheese, I still couldn’t do it. So, instead, I made a cheese sauce that is super easy and tastes super good without the trouble of making a roux. WIN! All you do is add butter, milk and then the cheese! Heat over low heat until melted, add the seasoning and then pour over the noodles! Easy peasy! 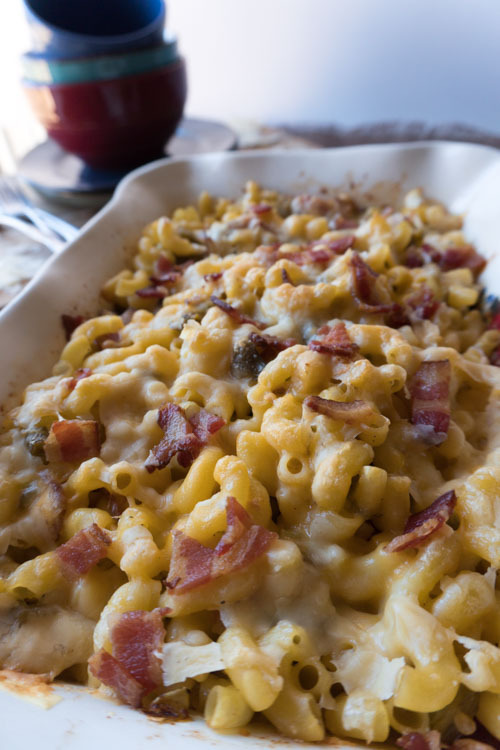 I think if the roux had worked it would’ve made a creamier sauce, so I might still try to figure that out and get back to you all, but until then this bacon mac and cheese recipe is delicious as is! I love the added bacon and green chile! If you don’t have green chile, no worries. The bacon adds lots of flavor on its own. I typically bake my bacon in the oven. It’s really easy and not super messy. To find out how to bake bacon check out my loaded scallop potatoes recipe here! You can serve this up as a side dish or fill a bowl and eat it as the main dish! It is so delicious and perfect for a cold day! It is totally a comfort food! If you are looking for more yummy warm comfort foods check out this easy turkey leftover chili, or my favorite green chile stew! 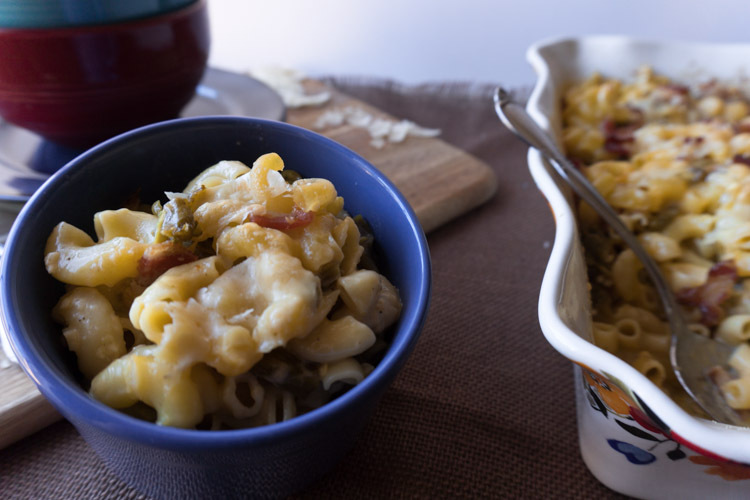 This easy and super yummy mac and cheese has four different types of cheese and bacon! Who could ask for anything more?! Cook bacon in a medium sized skillet or in the oven. Set aside. Cook macaroni according to package instructions. If there is a range of time for cooking (i.e. 6-8 minutes) go for less cooking rather than more. The noodles will cook more when everything bakes. Drain, rinse and set aside. Preheat oven to 350°F. Grease a casserole dish (with butter or olive oil) that is big enough and deep enough to fit all the noodles with a little space left over. I used a 3.6 qt dish, the is 13x9x 3.5. Add salt, pepper, garlic powder and, dry mustard powder to cheese sauce. Assemble dish. 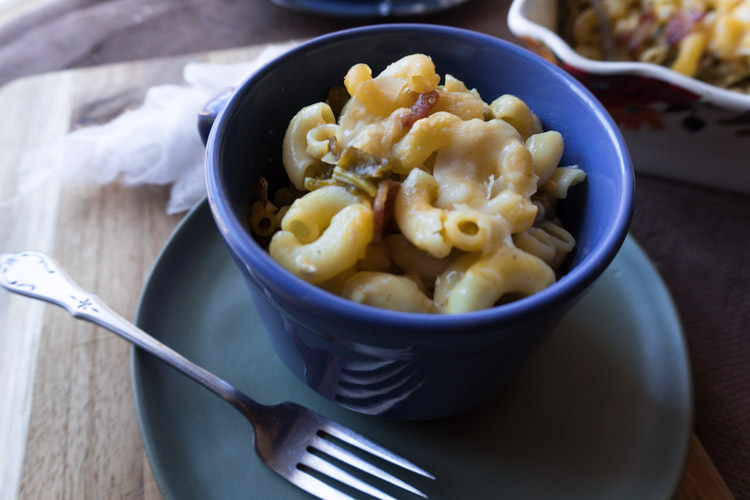 Pour the cooked macaroni into the greased baking dish, add the bacon and green chile (if using). Pour the cheese sauce over noodles and gently stir to mix in sauce evenly. Sprinkle remaining ½ cup of sharp cheddar cheese and all the parmesan cheese on top. Bake for 30 minutes, or until the cheese starts to brown slightly. *As slow as it is to heat the cheese and milk over medium low heat, it helps prevent the cheese from curdling and separating.